Looking at the list of starts before the rally, we could see that Antoine L’estage was a big favorite for this edition. Djordjevic, Crazy Leo, Besner, Leblanc could hope for a podium overall. From the start, L’estage shows everyone that he is not here to go sightseeing, he is ahead of his nearest pursuer of 1m20sec after only 3 specials. Djordjevic, Besner, Leblanc and Gauvin complete the top 5 of the first 3 stages. The strong lead that Estage has forged at the start comes to help him, since he has mechanical problems during the last 2 stages of Saturday but retains his first place. Behind, Jean-Sebastien Besner is placed in 2nd position with a flawless steering and taking advantage of the troubles of Djordjevic. André Leblanc consolidates his 3rd place. With the withdrawal of Gauvin, a beautiful battle is emerging between Nicolas Laverdière and Mikael Arsenault to complete the top 5. The competition is strong at the start of the Sunday specials behind the Estage between Besner and Leblanc for 2nd place and between Trivino, Laverdière and Arsenault for the top 5. With his faultless work, Besner digs ahead of Leblanc and assures his 2nd square. Behind, with the troubles of Trivino, Arsenault comes to finish an excellent rally with a 4th place in front of Laverdière with whom he fought hard all weekend. Antoine L’estage who is the ROI at the BDC finishes 1st with his 8th win here, in 2nd place with a superb faultless rally, Jean-Sébastien Besner gets on the podium for the first time at Baie-Des-Chaleurs. had finished at the foot of the podium too often. In third place, the brothers Leblanc are going to another great performance having finished 2nd last year. Mikael Arsenault and Nicolas Laverdière complete the top 5. 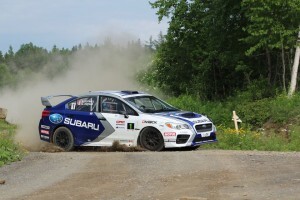 Jean-Sébastien Besner Ends a 20 Year Wait and Wins the Rallye Baie-des-Chaleurs ! Brothers André and René Leblanc Repeat Their Rallye Perce-Neige Success ! The 5 National Eastern Rallye and Pirelli new Partnership!